In the midst of a week of some great shows in D.C., the best one is probably going to be The Empty Hearts/Dot Dash gig on Thursday at The State Theatre in Falls Church, Virginia. And if the prospect of seeing this supergroup -- Clem Burke from Blondie, Elliot Easton from The Cars, Wally Palmar from The Romantics, and Andy Babiuk from The Chesterfield Kings -- was not enough to get you out to NoVa on Thursday night, then let me tell you that D.C.'s own supergroup -- Terry Banks from St. Christopher, Tree Fort Angst, and Julie Ocean, Hunter Bennett from Julie Ocean, Danny Ingram from Youth Brigade, Swervedriver, and Strange Boutique, and Steve Hansgen from Minor Threat and Government Issue -- are the openers! Man oh man, is there gonna be a lot of talent (and rock history) crossing that stage on Thursday night! And this will be the second time that Dot Dash have opened for Clem Burke, having opened for Hugh Cornwell back in the fall of 2011 when Clem Burke was the drummer. As you probably know by now, The Empty Hearts album is a blast. The record is one of the most fun releases of the last few years and fans of power-pop should love this one. I think I raved about it quite a bit in my review last month but it's the sort of record that is worth raving about. 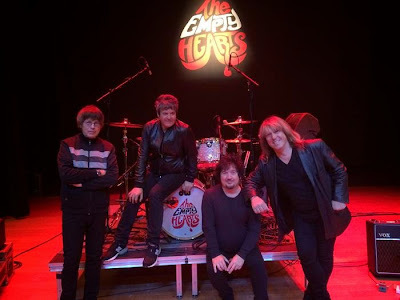 Since I first posted about The Empty Hearts they've gone and released a new video. Check out the new vid for "90 Miles an Hour Down a Dead End Street" below and then head over to the band's official Facebook page or their official website. Dot Dash have just recorded album number 4 with producer Mitch Easter. Word has it that it will be released in a few months. If you didn't make it to WMUC in October when Dot Dash rocked the place, here's your chance to hear some new tunes from the band. I'm pretty sure the band will crank through a few new ones in their opening set. And in case for some strange and inexplicable reason you still haven't bagged their last album, the nearly-perfect Half-Remembered Dream from TheBeautifulMusic.com from 2013, then here's another chance to download a free MP3 from the band. Go here to get the cut. And then get your tickets for The Empty Hearts/Dot Dash at the State Theatre on Thursday, December 4, 2014.